musebook midimic , real-time Sound2MIDI, converts sound detected from microphone into MIDI data in real-time. 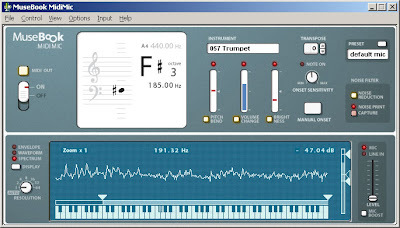 musebook midimic determines Pitch, Dynamics and Timing and simultaneously converts each note as MIDI data. While you are singing, you can hear your voice changed into some other instrument you choose of 128 MIDI instruments. Any monophonic instrument solo e.g. guitar, violin, recorder, saxophone, etc. can be also used as sound input. Preset : Supports preset to save and load your settings as you like.